Fiskars Titanium knives are the latest innovation in cutting. They combine design with functionality in an innovative way. 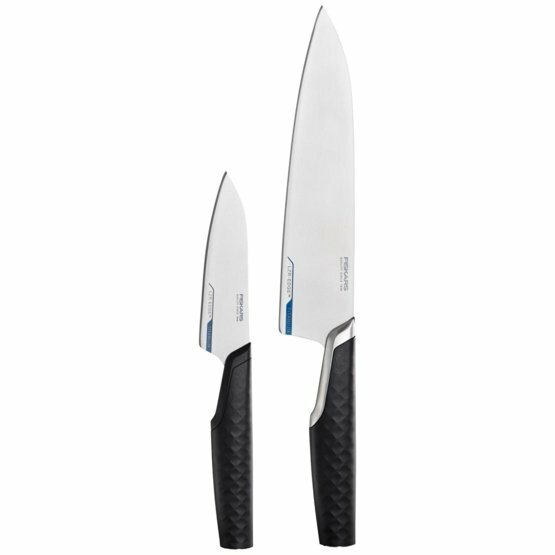 Knife blade is made of titanium, which allows extreme lightness and control in use. Revolutionary LZR-EDGE™ technology with titanium carbide particles on the cutting edge keeps the edge sharp 4 times longer than standard knives. Modern design language with stainless steel bolster and end cap keep the balance perfect and three dimensionally patterned handle enables comfortable grip. Hand washing recommended.